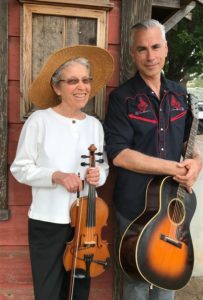 The Dithers is a Santa Barbara Old Time fiddle duo available for weddings, parties, and other events in Santa Barbara and surrounding areas. They have a repertoire of hundreds of Old Time American Fiddle tunes and are known to cause spontaneous dancing and bring joy to listeners of all ages. California native Erika Smith, fiddle, is well-known to those around the central coast’s Old Time Music scene. Erika has a solid reputation for being “the real deal” in authentic American Music. She has over forty years experience as a fiddler and has played for Contra Dances in and around Santa Barbara for nearly fifteen years. Originally from Cleveland, Ohio, guitarist Greg Korzen quickly made a name for himself after moving to Los Angeles jamming with members of well known bands like Wall of Voodoo, Guns N’ Roses, Red Hot Chili Peppers, Blondie, Steppenwolf, and many others. His interest in Old Time music began during his boyhood in Cleveland when he watched the television show Hee Haw and was further reinforced by having families from Kentucky and West Virginia living in his neighborhood. For more information and audio clips please click here.